MiniSkybot Robot V1.0 by obijuan is licensed under the Creative Commons - Attribution - Share Alike license. This robotic platform allows the students not only to learn robot programming, but also to modify easily the chassis and create new custom parts. 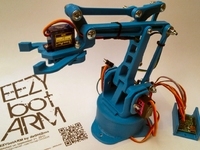 Being open source the robot can be freely modified, copied, and shared across the Internet. In addition, it is extremely cheap, being the cost almost exclusively determined by the cost of the servos, electronics and sensors. Also, there are serveral engineering students involved. 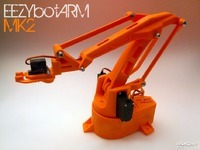 The electronics consist of the open-source hardware Skycube board (http://www.iearobotics.com/wiki/index.php?title=Skycube), a small board with an PIC16F876A micro-controller designed with the open-source Kicad EDA tool. We want to thank to all our students who are testing and improving this robot. 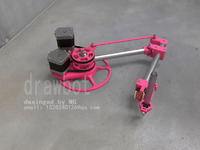 Special thanks to Olalla Bravo ( http://www.thingiverse.com/Olalla ) for the design of the Castor wheel. 9) The robot is ready for programming!